If you have any questions about the SILVER information page below please contact us. This motor yacht SILVER is a 73 metre 241 (ft) lengthy aluminium ship which was constructed at Hanseatic Marine Engineering Pty and devised by Espen Oeino. Accommodating 18 guests and 16 crew, motor yacht SILVER used to be (Project Silver) as her shipyard project name or yacht title. Completed in 2007 the comparatively recent interior decoration promulgates the extant artistry from Hanseatic and their approach to interior yacht design. Motor Yacht SILVER was designed by Espen Oeino with the aim to meet specific performance and environmentally conscious goals of the owner. Her semi-displacement hull creates a highly efficient and stable platform and her chic interior is designed from advanced lightweight materials. This very minimal and modern design creates areas that are warm, comfortable, and casually stylish. Espen Oeino was the naval architect firm involved in the professional vessel design work for SILVER. Her interior design was realised by Hanseatic. Espen Oeino is also associated with the yacht wider design collaboration for this yacht. In 2007 she was formally launched with celebration in Henderson Wa and post sea trials and finishing touches was then passed on to the yacht owner. Hanseatic Marine Engineering Pty completed their new build motor yacht in Australia. Her core hull was built out of aluminium. 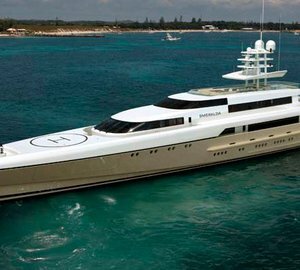 The motor yacht main superstructure is fabricated extensively from aluminium. With a beam of 10 m or 32.8 feet SILVER has spacious internal space. She has a reasonably shallow draught of 2.5m (8.2ft). She had refit maintenance and modification undertaken by 2008. Installed with twin MTU diesel main engines, SILVER can reach a top speed of 27 knots. For propulsion SILVER has twin screw propellers. She also has an efficient range of 4500 nautical miles when motoring at her cruise speed of 18 knots. Her total HP is 6612 HP and her total Kilowatts are 4930. The volumous luxury yacht M/Y SILVER can sleep as many as 18 people and 16 professional crew. 73.3 metres / 240.5 feet. Giving the combined power of 6612 HP /4930 KW. 4500 at a speed of 18 knots. The luxury yacht SILVER displayed on this page is merely informational and she is not necessarily available for yacht charter or for sale, nor is she represented or marketed in anyway by CharterWorld. This web page and the superyacht information contained herein is not contractual. All yacht specifications and informations are displayed in good faith but CharterWorld does not warrant or assume any legal liability or responsibility for the current accuracy, completeness, validity, or usefulness of any superyacht information and/or images displayed. All boat information is subject to change without prior notice and may not be current.